Petrol pumps, globes, 2 gallon fuel cans, oil tins & other petroliana. Homepage. This page: Collecting petroliana, ie all things oil- and fuel-related, such as petrol pumps, 2 gallon tins, signs and oil bottles. Collecting old garage signs, petrol pumps, globes, oil cans, books, brochures and similar memorabilia has been a popular pastime for many years, with these items collectively known as automobilia. Within this group are several sub-categories, each of which have their dedicated followers. This page looks at petroliana, ie anything relating to petrol and oil companies of days gone by. Petroliana collectors focus on anything produced by the oil/fuel companies, and track down items large and small, from promotional keyrings and stationery, through oil cans and pourers, to large heavy items such as old oil cabinets, petrol pumps (gas pumps in the US), and the illuminated globes that would fit onto the old pumps. Some areas of petroliana collecting follow, articles with more in-depth reviews and photographs will be added to this section as time goes by. Few things decorate a vintage garage scene better than an old petrol pump, preferably with a period glass globe carefully positioned on top. The design of pumps evolved over the years. In the 1920s and 1930s several companies supplied garages with hand-operated pumps, many in Britain were produced by the Bowser company. One of the most sought-after of the Bowser pumps is what became known as the "fat boy" (not terribly PC but in those days people weren't so easily upset). Post-war, pumps such as those built by Avery Hardoll and Gilbarco became extremely commonplace, early examples were fitted with a clock-type face. Later models featured rotating drum displays, and came in a variety of sizes depending on whether they were to be used at a large roadside filling station, or a small country garage. As the 1950s rolled into the 1960s, the design of petrol pumps became less attractive to many people's eyes, and the illuminated globes - by this time plastic rather than glass - began to disappear. Most classic petrol pumps have long since disappeared, although occasionally they can still be spotted in farmyards, dispensing diesel to the tractors. In the farm next to us there is a very early hand-operated pump, and I found the remains of a similar 1920s/1930s pump at a coal merchant a couple of years ago. Many of the old garages have been swept away too. 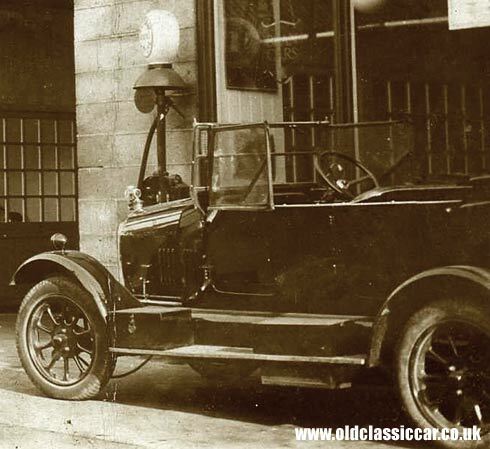 The first kerbside petrol pump is believed to be that installed at Betton House Garage, in Shrewsbury, by F.A . Legge in 1914. Happily, there are still a few pre-war garages around that have the old petrol pumps outside, usually on display rather than in active use. Most of those that do survive are now in museums, or in the hands of private collectors. I'll add a page specific to older petrol pumps shortly. Makes found in Britain would have included Avery Hardoll, Bowser, Beckmeter, Gilbarco, Wayne, and Gilbert & Barker. The illuminated globes that fitted onto the top of petrol pumps are keenly sought-after in their own right, as well as by collectors looking to finish off the restoration of an old pump. Shapes and styles changed as the pumps themselves underwent re-design. Early globes were simple bowl-shaped affairs, and in later years developed into a variety of shapes, often echoing the advertising of the fuel they dispensed. One of the most distinctive designs were the shell-shaped globes, fitted to pumps supplying Shell Mex Motor Spirit. Easily damaged, older glass globes are very popular, and many of the popular designs have been reproduced. But to collectors, only the originals will do! This photo of the Causeway Garage in 1927, shows just some of the different globe designs that were to be found. Fuel companies were keen to promote their products as best they could. Illuminated pump globes did a good job, but brightly-coloured enamel signs soon joined them, all designed to catch the eye of passing motorists as they sped along. In the 1920s, signs proliferated and often hid much of the garage building, so large and prominent were some of them. Whereas old-car fans can't get enough of these enamel creations today, many people in the pre-war days couldn't stand the sight of these garish creations, often put up with little regard for the local environment. The Council for the Protection of Rural England (CPRE) were vocal in their disapproval of such ghastly sights, especially if the garage building itself was a hastily-erected affair, with little regard to aesthetics. The Petroleum (Consolidation) Act of 1928 provided guidelines to local councils on what was, and wasn't, deemed acceptable when it came to the design of new garages. Controls on excessive use of road and garage signs were also introduced, toning-down the more extravagantly-decorated roadside garages. Very early garage signs, such as the 1920s' offerings from Shell, Mobiloil, Pratts and Redline to name just a few, are consequently hard to find nowadays. Of those that do survive, many have suffered from the ravages of the elements, with those that were hidden beneath a canopy, or fitted to an interior wall, best placed to be in good condition some 80-90 years later. Unfortunately, the popularity of collecting signs and petrol pumps means that there are few bargains to be found. Fortunately, there are plenty of other items of petroliana that are less painful to the wallet. Two-gallon petrol cans are extremely popular. Buyers range from the vintage car owner who is looking for a suitable fuel tin to put on his or her car's running board, through to collectors whose ambition it is to fill their shed/garage/home with 2-gallon cans from as many different motor spirit companies as is possible. Prior to the widespread take-up of roadside pumps in the 20s and 30s, it was by 2-gallon tin that most supplies were distributed across the country (see examples of National Benzole delivery note and invoice, dating to 1924, and an order for twenty gallons of War Spirit 2 placed in 1919 with the Bowring Petroleum Co. Ltd.). The familiar metal two-gallon fuel cans were sold well into the 1950s, although by this time were plain, and devoid of the attractive legends found on the tins of the 1920s and 1930s. Some examples are still quite plentiful - those with Pratts, Shell Motor Spirit and Esso for instance are quite easily found, and tend to cost from £5-10 for an average example. As with all aspects of collecting, there are rarer examples of the subject that can cost many times this, and tend to be the preserve of the fanatic-collector only. I've bought quite a few 2-gallon petrol tins over the years, but the rarest, stamped with the Glyder name, was found at the oil drop-off point of a local tip, a few years ago. The same tip also turned up a smart Redline fuel can, complete with the correct brass cap still in place. One of my favourites is the Shell Aviation Spirit can, which features a winged logo on either side - an example of such a can is shown above. Good examples of this fuel tin can cost from £25-30 upwards. If I can find some good clear photos of other tins, I'll add them in. One of my favourite tins, and one I use regularly, is the Eversure Fillacan. Oil tins, pourers and bottles. Memorabilia relating to oil manufacturers also falls within the Petroliana title, and is just as popular with most collectors. Oil has been distributed in tins and cans since the beginning of popular motoring in Britain, and as with the fuel tins, is keenly collected. Some people stick to products of just one firm, say Esso or Newton Oils for instance, and collect anything and everything bearing these logos. Whereas fuel cans were typically of one or two gallon capacity, oil was distributed in a much greater choice of quantities, and keen enthusiasts will often look for each capacity of oil container. These might range from simple 1 pint bottles and tins, through to larger, trade-sized containers. Old oil bottles are also very popular, and for obvious reasons tend to survive less well than their metal brothers. An A35 I bought came with several original bottles of BP Energol oil, and they've been preserved with it. Oil pourers are also worth looking out for, although because they tend to be used over and over, rarely have good illustrations still on them. Occasionally, really oily old pourers turn up that, with a good clean, can be transformed into gleaming, new-looking, examples, but these are definitely in the minority, with most looking like they've seen many years' hard use. Other oil & petrol company items. Described above are some of the key areas of Petroliana collecting, but dig a little deeper and there are many other collectables that fit the bill, and can often be found for modest sums only. Some examples can be found in the motoring collectables section of this site. Leaflets were freely given away, and while most of this ephemera has long since been consigned to the dustbin, some interesting little oddities still turn up - this Esso Service leaflet, and this Regent Lubritection service logbook, are just two examples of thousands of hand-outs that would have been printed. Road maps are also worth keeping an eye open for a junk shops and book stalls, many of which were issued by oil companies. Other items featured in that section of the site include this Dextrol Oils leaflet, Dominion News (1930s magazines from the Dominion petrol company), Essolube Oils and this Mobiloil desk blotter. In the early 1930s Shell-Mex published a super book containing lift-up cutaway drawings of the motor-car, read more about it on the The Modern Motor Car page. If you prefer old toys, items such as this plastic & tinplate Esso tanker, made by Wells Brimtoy, could be worth tracking down. Keyrings, diaries, and calendars also regularly turn up for sale. Ideas for some other car-related things to collect are described here. 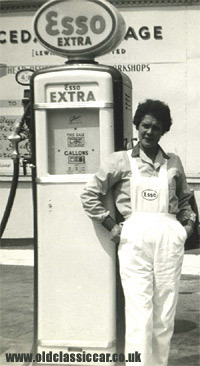 Two ladies who work at an Esso garage are shown here, stood with a tall Esso Autodiesel pump of the 1950s. One of the above ladies is seen again, this time with an Esso Extra petrol pump & globe. A military-owned vehicle is seen being topped up by a garage mechanic. 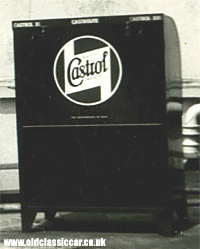 An old Castrol oil cabinet. 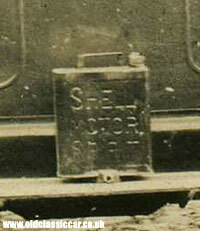 A Shell Motor Spirit 2-gallon petrol tin, affixed to the running board of a vintage car. Oldclassiccar.co.uk features many old collectables, spread across a variety of sections. The site search at the foot of this page will help find these, if there is anything in particular that interests you. Listed below are some other sites that are worth taking a look at, as they focus either on the collecting of Petroliana and feature articles and photographs, or else look at the history of UK filling stations. Petroliana, a fascinating site describing one man's collection of petrol pumps, signs, tins and related items. British Petrol Stations, a look at older British filling stations, and their branding. Vintage Gas Museum, US gas pumps, signs and memorabilia. I'm on the look-out for an old British petrol pump. Also wanted, anything relating to Notwen Motor Oils.